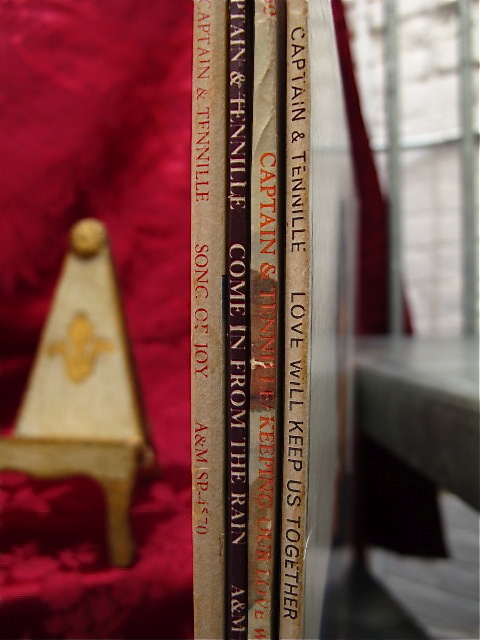 The Captain & Tennille exploded on the music scene in 1975 with a spirited, ubiquitous cover of Neil Sedaka’s “Love Will Keep Us Together,” as infectious a pop song as was ever recorded as well as a Grammy-winning, number-one record. Toni Tennille, she of the soaring voice, warm, down home demeanor and era-defining bowl haircut (which I still affectionately refer to as “The Tennille”), and (ex) husband Daryl Dragon, the introverted keyboardist with the hat collection, briefly filled the pop culture vacuum that had been left by the jarring divorce of America’s erstwhile first couple of song, Sonny & Cher. Their brand of feel good, positive pop (called “Middle of the Road” or “Easy Listening” back then) was, perhaps, the predominant sound of pop radio until it was crushed by the stiletto heel of Disco and punk rock’s combat boots a bit later in the decade. But for at least two or three years, the Captain & Tennille were major hit makers. The duo created slick adult contemporary pop records for their label A&M records. Their songs were made for shopping malls and AM radio, and in short order they scored an impressive seven top-ten hits throughout the Bicentennial and beyond with songs like “The Way That I Want to Touch You,” “Do That To Me One More Time” (their last hit and another number-one), “Shop Around,” “Lonely Nights (Angel Face),” “You Never Done it Like That” and, most curiously, a cover of America’s “Muskrat Love” for which the Captain’s adroit noodling on the synthesizer effectively dramatized a conversation between “Sammy” and “Susie,” said titular muskrats. In addition to the soundtrack of my grade school years, Toni Tennille also provided me with a wonderfully positive thought that I would like to pass along to you. 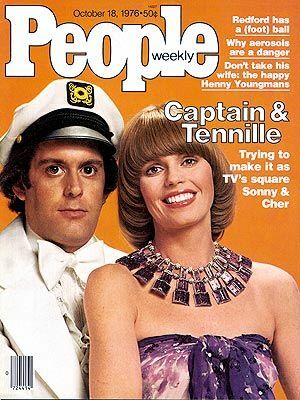 Like the Bonos, the Captain & Tennille followed their radio success to a weekly network variety show that did very well for a season. The duo’s fortunes began to fade in 1977, when Toni and Daryl, in an unfortunate O. Henry-esque plot twist, electively abdicated their hit TV show to focus more on their music just as radio’s growing interest in Disco and New Wave music reached critical mass, leaving mainstream artists Toni and Darryl and their brethren (Helen Reddy, The Carpenters, John Denver, to name a few) holding a bottle of poppers and wondering how they went to the right address and ended up at the wrong party. 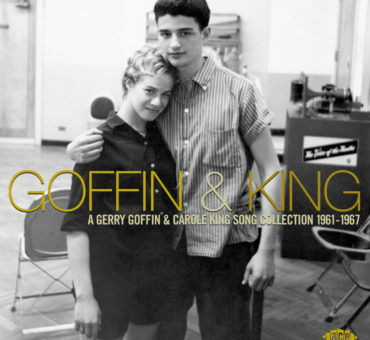 I am proud to say that in addition really being a fan of their music, there were a few other things about Toni and Daryl that spoke to me as a kid. One was the mies-en-scene of the Come In From The Rain album cover, which, like Jaime Sommer’s house on Bionic Woman, depicted my fantasy of an idyllic, cozy, treehouse, and forever influenced my design aesthetic. 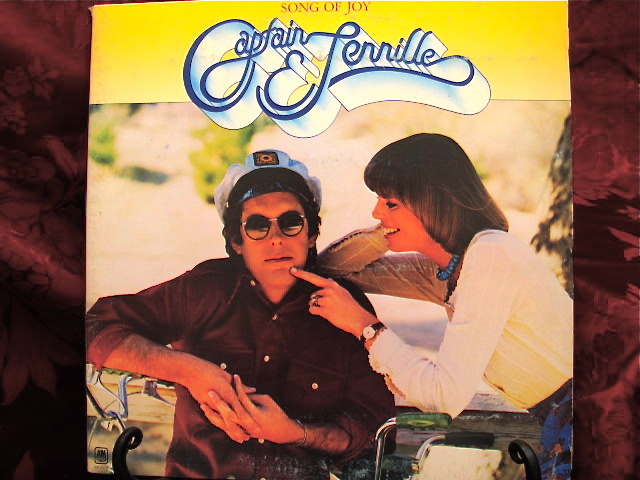 The visual was but an extension of the Captain & Tennille gestalt: positive, warm, filled with love. I met Toni once—actually just a few years ago—with Natalie Cole backstage at Carnegie Hall at a tribute to Neil Sedaka. She looked the same: like a neighbor down the street—the kind your mom trusted when there was a problem and who always took care of you on Halloween. I took the opportunity to introduce myself and told her I’d always admired her. After the show, I remembered something Toni had said that I read many years ago. Asked several years after their career peak if she felt angry or bitter that their outsize multi-media success didn’t last longer, Toni replied with the sanguine, glass-half-full practicality that defines her, “You know, we invested conservatively and we had a really good run. I’m really grateful.” Trust, If it were me, you can bet I would be pissed that after all my hard work and living a clean life that radio changed and Neil Bogart died and Casablanca Records probably spent the Captain & Tennille’s promotion budget on cocaine. Yeah, I’d be pissed, but not Toni. The Tennille glass-half-full approach continues to periodically present itself to me. Just yesterday, after six months of on and off obsession as to what song the melody for R. City and Adam Levine’s late-2015 number one hit “Locked Away” was almost identical to, I hit upon it: its chorus is nearly identical to the verse of Toni’s 1980 number one hit “Do That to Me One More Time.” I tweeted Toni immediately asking her if she’d heard it and received the classiest reply you could imagine: “Yes I have,” she replied, ” … the writers acknowledged the influence + gave me credit and I’m appreciative.” Imagine that? Appreciative even though someone stole her melody! It was perfectly punctuated and just, well, just so Toni. Nowadays, I try to put a little of that Tennille spirit in each of my days. If you’re ever feeling a bit down and need a little pick me up, listen to any of her classic records. I especially like Song of Joy. It is in this generous spirit, I want to share an authentic recipe for Toni Tennille’s Rice Creole Dish that will, like its namesake, be easy and pleasant. Sauté 2 chopped onions in olive oil until golden brown. Add 1 chopped bell pepper and 3-4 pieces chopped celery and simmer until tender crisp. Add 3 cups of chopped tomatoes. Cover and simmer until tomatoes cook down and become liquefied. Add 1 cup (washed) brown rice along with the juice of ½ lemon, 2 tablespoons sweet basil. Add cayenne pepper, Spike or seasoning to taste. Bring all ingredients to a boil, then lower heat and simmer 45 minutes. Remove lid and add cheese to top. Place under broiler to brown cheese, or replace lid and let cheese melt through. Note: Above ingredients may be increased according to personal taste, such as spices. "The Way That I Want to Touch You"
"You Never Done It Like That"
I simply want to mention I am just new to blogs and seriously loved your web site. Probably I’m want to bookmark your blog . You really come with fantastic articles. Thank you for sharing your blog site. Yes, Toni has always been a positive person. Great reading!! This is a wonderful read. I’ve always loved Toni’s voice. SO glad I actually got to see them in their prime. I’m not sure what was more miraculous–that my parents consented to take a grade-school kid to that concert, or that they came to our podunk Missouri town in the first place. I guess, like Toni, that I’m just grateful. God bless her. Thanks for your comment and for checking in with the blog. Great article!! I have always love the Captain and Toni, had their albums, and pictures on my bedroom wall . I even have a Toni doll in the original box. I will be waiting to read her book. I was lucky enough to see Toni and the Captain live at the Spokane Opera House when I was 13 back in 1975! Your description of gazing at their “Come in from the Rain” album cover and wanting to climb inside… that was me as well. 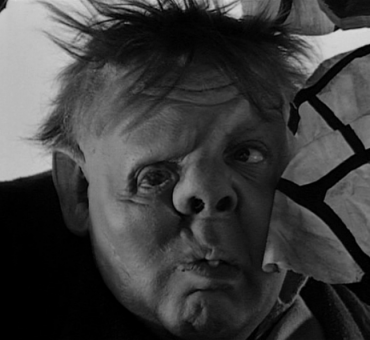 Anyway, thanks for the article… brought back fond memories. Brian your anecdote was priceless and completely relatable. The image of you acting out that commercial is incredible. These kinds of comments are truly the reason I love my blog so much. I hope you’ll stay in touch. Great post, David! C&T rocked my world for several years, beginning in mid ’75, around the time I graduated from junior high. After hearing LWKUT a few times on the radio and instantly LOVING it, I was surprised to see that Toni was white when I first saw the album cover at my local record store. A gorgeous, all-American white girl who sounded black. How cool was that? To this day, Toni and Chaka Khan are my two favorite singers of that era. One year later my dad took my whole family to see C&T in concert in Chicago. By then I’d become a member of their fan club and brought along a newsletter in which Toni wrote how much they love meeting fan club members after a performance. I knew it was a long shot, but I also brought my two C&T album covers, in the event I should be so lucky to meet them. Right after the amazing sold-out concert at the huge Arie Crown Theater where I’d seen The Carpenters twice before that, I convinced my family to wait in the lobby while I attempted to figure out a way to get backstage. I soon found an elevator, in front of which stood a rather ominous-looking security guard. I politely inquired about getting backstage, explaining that Toni said that as a fan club member, I could meet her after the show (as if she told me this directly! ), and I showed him the fan club letter. Because he was amazingly nice and it was a VERY different world in 1976, he allowed me to take the elevator down to the lower level, where the green room, dressing and reception rooms were located! Can you believe it?! There was a throng of adults an kids already lined up to meet Toni and Daryl. I kept wondering how all these people were allowed in. Surely they hadn’t all just showed up like me with fan club newsletters in hand! After 20 minutes or so, out came Toni and Daryl! Toni was dressed in a casual top and jeans, and she wore a cute straw hat with fresh tulips on it. I had a lump in my throat as I approached the table to meet them. I showed Toni my fan club letter and asked if she had received a letter I’d recently sent her and Daryl. Toni, being ever so sweet and gracious, turned to Daryl and said in her signature southern accent, “You remember Reilly’s letter, don’t you, Daryl?” “Oh yes!” he replied. Of course I believed them! They each signed both of my album covers, which I’ve taken extremely good care of all these years. You won’t find a single Magic Marker smudge on either. Like all their fans, a few years ago I was shocked and saddened by the news of their divorce. I’m even sadder now after reading Toni’s memoir knowing she was NEVER happy with Daryl. Yet I’ll always be thankful for their amazing music and positive energy, which was a very bright spot in my often darkish adolescence. Thanks for the memories, Captain and Tennille. Thanks in particular to Toni, who continues to be genuinely nice and gracious, and really cares about her fans. What other star of her caliber actually responds to people’s Facebook messages? She’s a gem.